I have a little thing for Saucony road shoes. I switched to the Kinvara 5 a few years ago, and truth be told, wouldn’t put anything else on my feet for a couple of years. Yes, the blown EVA outsoles wore down like a soft cheese being grated over 150 miles, but they ran fast, cushioned adequately and accompanied me to many PB’s and good running memories. My bank account was at mercy to them. I was in love. When Saucony sent me the Xodus 6.0 to review, I loved the traction and it was very much like my Kinvara had taken roids, mutated and wanted to tear up trails, leaving destruction and alpine ascents in their path. So much so, on their maiden voyage running back from La Flegere in Chamonix, I got cocky with a GoPro and rolled my ankle righting me off for the rest of the week. However, I forgave and my relationship flourished. So 18 or so months on and back on the road with Freedom ISO, how would I fare? In the past couple of years, I have tried road shoes from inov-8, Hoka and Salomon and has mixed fortunes (check out my REVIEW section). I’ve tried big cushion, mega grip and everything in between, from short intervals to half marathon training sessions. Remember I opened with the Kinvara being outstanding, but wearing away prematurely on the outsole…… well, with a Crystal Rubber Outsole, things have changed. Whereas the Kinvara had a combination of eva and rubber areas, the Freedom ISO’s outsole in one piece of rubber, with a relatively uniformed pattern throughout. It grips where required and feels vastly more durable. Moreover, the transparent application coats the EVERRUN midsole, stamped clearly underneath. The marketing bods mean business. From a trail background, I really like the grip the outsole offers, the confidence it inspires and the longevity it promises to bring for those high training miles. 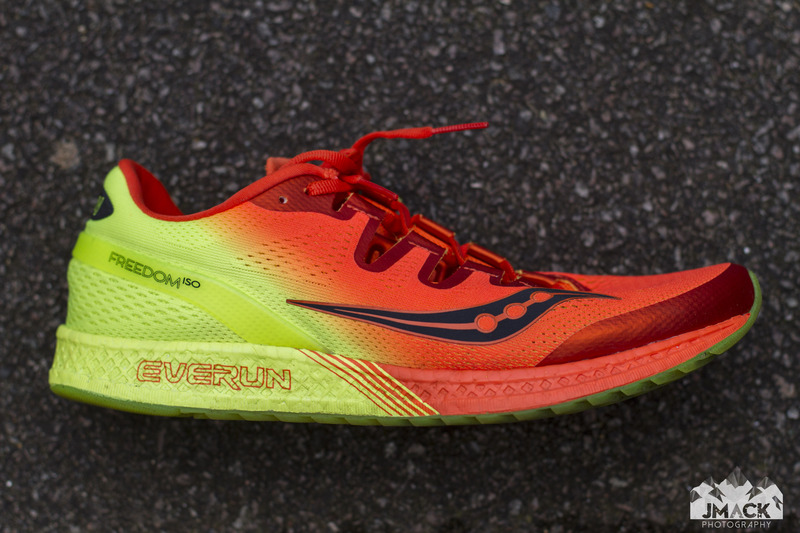 EVERRUN is Saucony’s new midsole technology. This is the first of Saucony’s arsenal to feature a full length EVERRUN midsole, with the objective to deliver a livelier and more responsive cushion, generating smoother landings and a stronger take off. I’ve harked on for a long time about shoes having to fit and work with you. Well this is one of the moments. I’m personally not 100% happy with the EVERRUN midsole… there I said it. It’s very cushioned, its doesn’t fade as the miles increase and you can feel it in action, but for my running style, I found it didn’t work with me as well as the Kinvara’s. Yes, I know they are different, so hear me out. Over the past year I’ve grown accustomed to firmer midsoles on the roads and trails, along with my day to day shoes. Soft, cushioned midsoles take a while for my calfs to adjust to, without waking up the next day with iron girders in their place and ankles unsure of a stable foot strike. My gait tends to be mid foot, with a slight pronation. I found the EVERRUN midsole to promote a slight pronation as soon as I put the Freedoms on. However, every story has two sides and it was when I mixed up my running that I made my discovery. When I landed more on my heel, the midsole worked wonders. It absorbed the impact and energy well, taking out the shock and judder, allowing for me to run unimpeded. And with that, for me, the lock behind EVERRUN was opened. Given it’s single piece construction, running the length for the shoe, for me, those with a slight or profound heel strike will benefit, as well as those who like a good sumptuous cushion. So, underfoot, it’s a mixed review, but try before you buy and this could well be a winner for you. Up top, things are as comfy as that guilty pleasure of a jumper that doesn’t see the light of day, yet accompanies every winter evening in your house. The stretch mesh is flexible, conforms with the foot and is more a kin to a slipper. Compared to many stretch uppers, it’s softer and more malleable than others, but I personally found it does run a little warm. I have hot feet throughout summer. I live in flip flops at work and rarely wear socks. One of the features which drew me to Saucony in the past was the fit. The ISOFIT draws support across the foot, providing secure and even fit. The tongue features groves that allow for a greater lock and holds the tongue in place through the run with a greater sense of security. Over the issues with midsole, for my personal preferences the fit is the major redeeming feature. Combine this with a supportive and supple heel counter and it’s a greater ride, regardless of the sock you use (I like to try a variety of weights, materials and styles). With a 4mm drop (Heel 19mm/Forefoot 15mm) it encourages a fast turnover and cadence, I never found it wanting for a more. At 255g, they’re light enough and the cushion will surprise those who haven’t experienced Hoka’s blend of lightweight and cushion. And so, the age old question, are they true to size? Yes, No, Maybe. Who knows?! I have always gone for 9.5UK in Saucony and the Freedom ISO are no different. They fit like a glove. I would whole heartedly advise going to your local running shop to try them out, we are all different. And if any of the above has left you confused, get on the treadmill in the shop! Aesthetically, I am a big fan of the punchy colours. The Orange/Citron shouts speed, with the Blue/Black/Citron being the pair you’d run and wear casually. For the less brave, Black and White/Gold options are available, but we both know the latter won’t stay that way for long without TLC. At £145, they are expensive. They are a step above my beloved Kinvara and many of the competition, but are they worth it? From a durability and construction point, they are top notch. Personally, they feel more suited to steady miles than speed sessions, supporting weary legs, over urging you to leave it on all out there. Whether they work for you is the key and I feel for some of you they will be your new obsession. I’d like to thank Laura at Deka Running Shop of Froome for sending me the shoes to review. This isn’t a paid endorsement.